[Image: Perspective by Jan Vredeman de Vries; no explicit relation to this post]. Writing about the human experience of night before electricity, A. Roger Ekirch points out that almost all internal architectural environments took on a murky, otherworldy lack of detail after the sun had gone down. 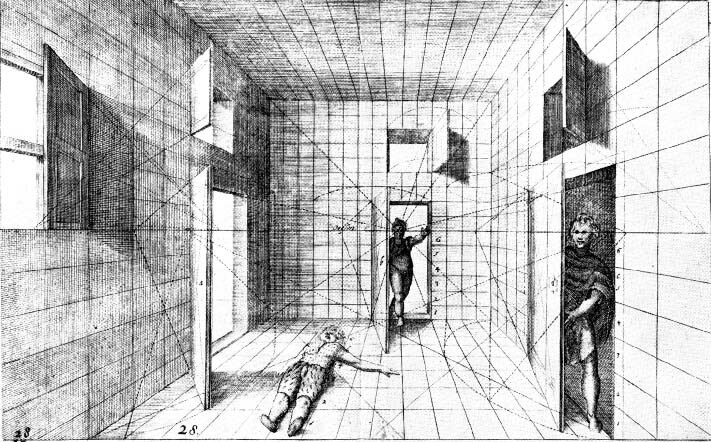 It was not uncommon to find oneself in a room that was both spatially unfamiliar and even possibly dangerous; to avoid damage to physical property as well as personal injury to oneself, several easy techniques of architectural self-location would be required. Citing Jean-Jacques Rousseau's book Émile, Ekirch suggests that echolocation was one of the best methods: a portable, sonic tool for finding your way through unfamiliar towns or buildings. And it could all be as simple as clapping. From Émile: "You will perceive by the resonance of the place whether the area is large or small, whether you are in the middle or in a corner." You could then move about that space with a knowledge, however vague, of your surroundings, avoiding the painful edge where space gives way to object. And if you get lost, you can simply clap again. Ekirch goes on to say, however, that "a number of ingenious techniques" were developed in a pre-electrified world for finding one's way through darkness (even across natural landscapes by night). These techniques were "no doubt passed from one generation to another," he adds, implying that there might yet be assembled a catalog of vernacular techniques for navigating darkness. It would be a fascinating thing to read. Some of these techniques, beyond Rousseau and his clapping hands, were material; they included small signs and markers such as "a handmade notch in the wood railing leading to the second floor," allowing you to calculate how many steps lay ahead, as well as backing all furniture up against the walls at night to open clear paths of movement through the household. Entire, community-wide children's games were also devised so that everyone growing up in a village could become intimately familiar with the local landscape. Games like "Round and Round the Village," popular in much of England, familiarized children at an early age to their physical surroundings, as did fishing, collecting herbs, and running errands. Schooled by adults in night's perils, children learned to negotiate the landscapes "as a rabbit knows his burrow"—careful after dark to skirt ponds, wells, and other hazardous terrain. In towns and cities, shop signs, doorways, and back alleys afforded fixed landmarks for neighborhood youths. Incredibly, Ekirch points out, "Only during the winter, in the event of a heavy snowfall, could surroundings lose their familiarity, despite the advantage to travels of a lighter, more visible landscape." The mnemonic presence of well-known community landmarks has been replaced by what mammoth calls a "whitesward." But this idea, so incredibly basic, that children's games could actually function as pedagogic tools—immersive geographic lessons—so that kids might learn how to prepare for the coming night, is an amazing one, and I have to wonder what games today might serve a similar function. Earthquake-preparedness drills? In any case, we return to Rousseau. We see him advancing, now, heading forward into unknown architecture, dark space enveloping him on all sides, the walls fading into obscurity, black, leg-breaking stairwells threatening in the distance, unsure of where he stands, entirely alone in this shadow... until we hear a series of claps. And then another. Then one more. And the philosopher, echoing himself, finding comfort and location based on objects he can't see, soon works his way out of the labyrinth. Quoting an 18th century philosopher on navigating unknown architecture is interesting, but it might also be interesting, and perhaps even more practical, to ask modern-day blind people how they make their way round unfamiliar environments. Phil, I agree—but I also find it incredibly interesting that vast stretches of human history occurred in circumstances functionally comparable to blindness. Another pedagogical tool that children use is, oddly enough, the Superball. Any kid with a Superball becomes a sort of phenomenologist by bouncing it along the walls in a room or building; realizing the space's trajectories and frameworks. Realizing it now, children also learn a bit about materiality in this way. I recently read Dark Universe by Daniel Galouye. It deals with a large group of vault dwellers who survived a nuclear Holocaust. Along the way they loose their power supply and are plunged into subsequent generations of darkness, where the people develope accute senses of ecolocation and deify the now incomprehensible concepts of light and dark. Each living chamber is equiped with an echocaster, a clockwork metronome used in the same manner as a lamp, even being turned off during sleeping periods. The culture developed a familiarization ritual in which children were drilled in the physical surroundings in preparation for adulthood. When veturing out of the living chambers to other parts of the underground realm they carried small stones which they clicked together to produce pings to reflect their surroundings. Add to this a small group who develope a mutation for infra-red vision and a group of outsiders trying to rescue the survivors and reintroduce them to light and you have a ripping yarn that throws around some great ideas. Maybe it's a myth but didn't old Paul Revere and the Minute Men gauge where they were on those night rides by how the sound of the gravel beneath the horses hooves would change, depending on the size of the gravel, its composition, etc? It would be interesting to map material composition and resiliency in echolocation as well as geometry. Somewhere in Jonathan Raban's marvelous "Passage to Juneau: A Sea And Its Meanings" he mentions that, in the frequent dense fogs, indigenous fishermen of the Pacific Northwest developed a way of judging their surroundings by echolocation - the different ways that a shout would echo off a nearby cliff vs a beach, off rock vs trees, etc. allowed them to build up a sonic picture of the landscape. I'm also fairly sure that I've read about a contemporary blind man who uses a clicker device to echolocate with incredible skill and accuracy - to the point, allegedly, of being able to detect dents in garbage cans as he passes them, for instance. Ekirch implies a lot. Sadly, my edition of the book does not have a list of his references. I presume other prints suffer the same problem. Nevertheless a fascinating read. Right now I'm reading Graham Robb's "The Discovery of France" (2007) of which I'm sure it matches your tastes. This might be of intrest. Is it ok to paste this onto one of my blogs? With credits of course. Jeremy, can you link to and/or quote from it? An ongoing discussion back in 2000 with now famous (Venice biennial) artist Shaun gladwell, focussed on out mutual love on pavements... mine from a landscape architectural perspective and his from a skateboarders. We discussed learning and understanding that the sound of the material under the wheels transferred so much information, even the thickness and material of the subgrade...?? ?